Learn how to make easy, natural, homemade baby wipes. 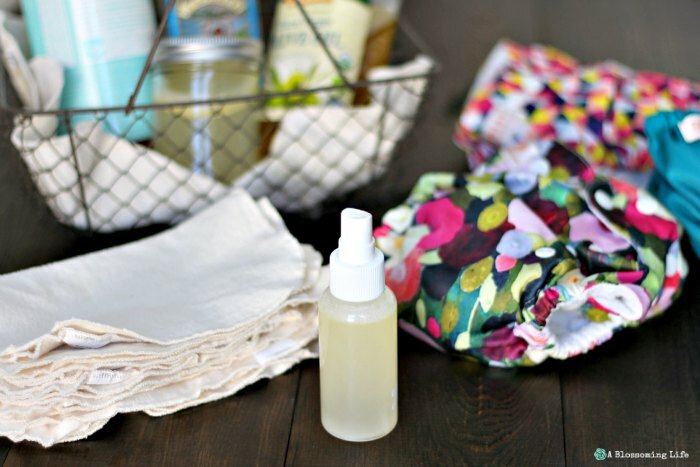 With just a few simple ingredients, you can whip up this DIY baby wipes solution. You can make this into disposable or reusable baby wipes. Homemade baby wipes are a super simple project anyone can do. Not only will this help you save money, but you know exactly what is going into the wipes, and they are much healthier than conventional store-bought wipes. Who has two thumbs and likes to save money and be more environmentally friendly? Me me! As with most of my recipes, this one came about because I found that I would rather make it myself to save money and be in control of what’s in the product. Maybe I have a control problem? Eh, I’m ok with that. Especially if it’s for the health (and pocketbook) of my family! Another must with any natural product is it has to be easy. These are basically the goals for everything in my life: healthy, cheap, and easy. Although, we do spend extra to get great quality food… but that’s a different story and a different tangent. These homemade baby wipes are super easy and take only a minute to whip up. And you can make them into disposable or reusable wipes. We do cloth diapers over here. Shocker, I know. Reusable wipes seemed like a no-brainer for us; it barely takes any extra time to use reusable instead of disposable, and I’m already washing diapers, so I might as well wash wipes, you know? All the ingredients in this recipe are ones I had on hand, and even if you don’t, they are easily found at any grocery store. What’s wrong with store bought wipes? Methylparaben (is an endocrine disrupter). These are just some of the ingredients from regular Huggies and Pampers wipes. This information came from the Environmental Working Group). This post contains affiliate links. A Blossoming Life is a participant in Amazon Services LLC Associates Program, an affiliate advertising program designed to provides means for us to earn fees by linking to Amazon.com and affiliate sites. We only link to products we use and love or would use. Now, not all store-bought wipes are less than ideal. There are some great brands these days, like WaterWipes (They are just water and grapefruit seed extract), and it seems like many brands are getting better. It’s definitely a step in the right direction. We use WaterWipes frequently when we are out of this wipe solution, or if we’re traveling. 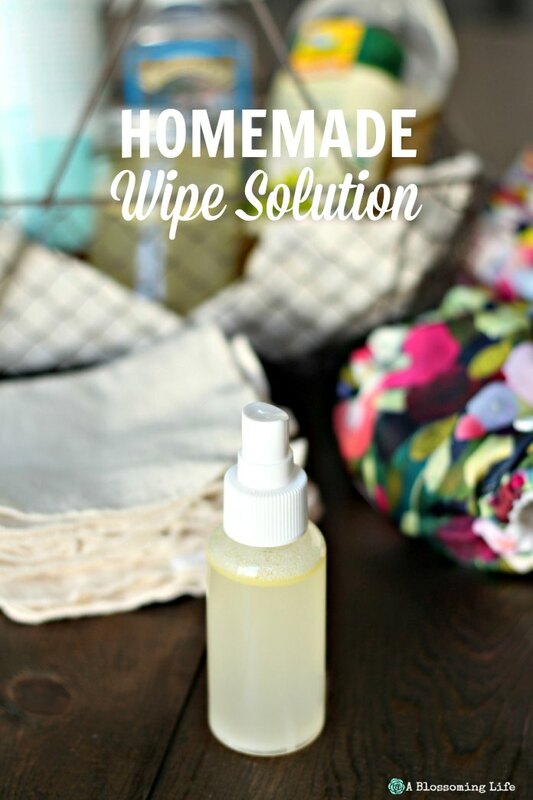 But my all-time favorite way to clean my kids is with this DIY wipe solution. The ingredients used in this recipe are gentle and moisturizing. Distilled water (or boiled water) – this helps keep the bacteria out. Witch Hazel (like this one, which is alcohol free) – astringent that helps reduce inflammation and skin irritation, and has an antibacterial effect. Olive oil – acts as a moisturizer. You could also use avocado oil or fractionated coconut oil. Castile Soap (I use the unscented baby Dr. Bronner’s) – help clean those baby booties! Lavender essential oil (this is what we use) – optional – has a calming effect on the skin. Mix ingredients together and set aside. Because it is super easy, I like to just put everything in a mason jar and then shake it up. To make disposable wipes, cut a paper towel roll (use good-quality, thick paper towels) in half with a sharp knife, and place half into a sealable container. You could also unroll the paper towels and place into a container. To use: pull off a paper towel (I like to squeeze out any excess baby wipe solution before I use it), use, and toss. If your baby is dealing with diaper rash, make sure to allow their booty to dry and then apply some natural diaper cream (like this homemade version). Basically the same process as disposables. 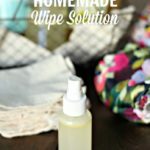 You can sew your own wipes from old flannel blankets, or purchase pre-made reusable wipes (ours were on our baby registry). You can either pour the solution over the cloth wipes, or put it in a spray bottle and spray the wipe solution onto a cloth wipe before use. This recipe is really simple and takes just a minute to whip up. 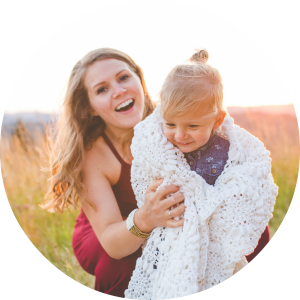 You can rest easy knowing the ingredients you are putting onto your child are healthy. How long do homemade baby wipes last? They should last at least 3-4 weeks without an issue, and probably longer. If they begin to mold, which can happen since it contains water, just toss that batch out and make new ones. Always try to keep them in a cooler environment and in a sealed container so they don’t dry out, and to keep bacteria out. Wipe warmers have been known to harbor bacteria (I know someone whose baby got an infection from one! ), so I would stay away from them. Learn how to make easy, natural, homemade baby wipes. With just a few simple ingredients, you can whip up this DIY baby wipes solution. You can make this into disposable or reusable homemade baby wipes. Mix ingredients together. I like to use a mason jar with a lid, and then pour mixture into a spray bottle. Before each use, shake bottle and spray on cloth wipes or paper towels. You can also shake it up and pour it into a wipe warmer (not recommended), or container of cloth or paper towels. To make disposable wipes: cut a paper towel roll in half with a sharp knife and place into a sealable container. You could unroll the paper towels and place into a container also. Shake up the baby wipe solution and pour enough solution over the paper towels to make them damp, but not soaking wet. Place lid over it, and allow it to absorb for a few minutes. Pull off a paper towel (I like to squeeze out any excess baby wipe solution), use, and toss. If your baby is dealing with diaper rash, make sure to allow their booty to dry and then apply some natural diaper cream. If using cloth wipes, use them and toss them into your cloth diaper pail to be washed with your cloth diapers. P.S. You could also use these on your face! Have you ever made homemade baby wipes? So glad you love them! They are also great for cleaning boogies off haha! I just LOVE this! It smells good and SO much gentler!